It seems like there’s always a sale going on at MacVideo Promo, and this one is no different. MVP is offering Boris RED v5.5 for under $350, a full 50% off the list price. This 3D visual effects and titling program includes over 200 filters and tools and can handle everything from motion tracking to image stabilization. And it’s half off? WOW. 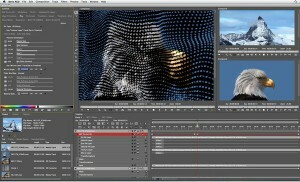 Boris RED is an integrated 3D titling and visual effects application that also serves as the successor to AVID’s FX software. With the ability to open older AvidFX files, Boris RED helps Avid users to upgrade seemlessly. And the titler offers lower thirds, animated 3D text and graphics. RT (real-time) Filters and Transitions. Improved performance and new integration with Avid software allow for near real-time preview of titles, transitions, and effects. Full Compatibility with Previous Avid FX Projects. Open legacy Media Composer projects in Media Composer/Symphony 8 and edit Avid FX titles and effects with Boris RED 5.5. Improved Text Tool Uniformity. The text tool in the Boris FX toolbar is added to Mac platforms to match the previous Windows toolbar. Text can now be typed and manipulated directly in the Boris RED preview panel. Improved Text Window Look And Feel. Numeric sidebars for accurate text sizing have been added for Windows users. Avid Media Composer 8, Symphony 8, and NewsCutter Compatibility. 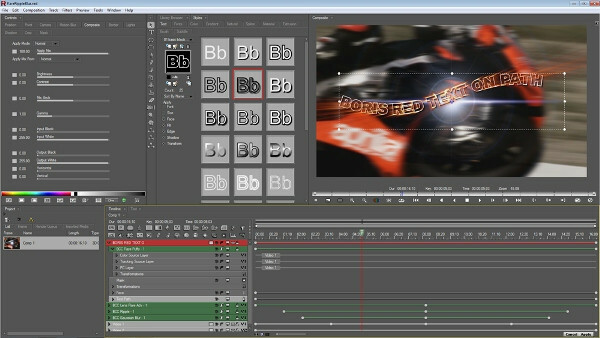 Starting with version 5.5, Boris RED will support all future versions of Avid editing and finishing applications. And if you’re already a current Boris RED user and don’t want to be left out in the cold, upgrading to vs. 5.5 will only cost you $200, which is a bit puzzling, because BorisFX said in it’s 2014 press release announcement that vs. 5.0 users are eligible for a free upgrade. It may be that the upgrade price is for previous Avid FX users, or that the free upgrade to vs. 5.0 users had a limiteEither way, it’s a good idea to verify your upgrade status with Boris before you pay the proverbial freight. That’s certainly worth the additional price of $200, a killer bargain. It’s easy to see what a great deal MacVideo Promo is offering Boris RED users, and those looking to explore the RED world as a potential post -production effects app. In addition, customers who purchase RED will be eligible for a free RED 6.0 upgrade that is scheduled to come out later this year. For more information visit MacVideoPromo here.